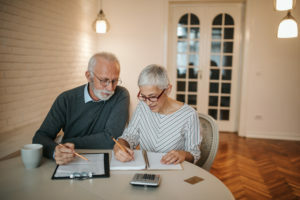 With all the money saving ideas floating around, I find that there are a few basic financial areas to address that most people forget about that can help maximize your dollars. This isn’t by any means a comprehensive list, but I would rather provide a list of key areas to consider – instead of a checklist 100 items long that even Santa Claus himself would have to put down for another day. So, without further ado, here is the list. Now get in there and save some money! 1. Please do not pay credit card interest. Never pay credit card interest – please! Sometimes unexpected expenses can pop up and require a last-minute credit card purchase. Life happens, and sometimes big purchases are unavoidable, but so is the crushing credit card interest rates north of 20% you may likely face. With rates that high, it is so very difficult to catch up on meaningfully lowering your credit balance because you are spending so much on interest each month. The first step is to know EXACTLY what you are paying in credit card interest because we can’t fix a problem that we don’t even understand! Once you do that, one of the best ideas remains finding a 0% interest carryforward credit card that you can consolidate your balances into. If you can’t find 0%, we urge you to get out there and find a more competitive rate than the one you are currently in. There are great resources to find a better credit card. One that we recommend for clients with this issue is creditcards.com. This site offers you a bunch of robust and viable options to consider when looking for a more cost-effective credit card. What you are looking for is a 0% balance transfer option – and be sure to read the fine print. Then, figure out exactly how much to pay to have your balance paid off by the time your introductory 0% rate expires! Remember – we want you using credit cards for purchases, but the only way to use them properly is to pay the balance every month. We like using credit cards because it helps create a good track record for you, which can lower your borrowing rate as your credit history improves. Yet, we don’t want you carrying a balance every month, or any month! 2. While online shopping, you forget to compare prices. Every time you are shopping online, or in a store, you must compare prices. We don’t want you missing out on a lot of deals that may be available for the product you are considering. One online shopping tool we are seeing more clients use is called Paribus. This tool can get you money back for your online purchases. The program is free to join, and it actually scans your email for any receipts that may hit your inbox. If you bought the item from one of the retailers they monitor, then they will watch the prices for you to let you know if it drops so that you can apply for a refund. Personally, I shop at Best Buy a fair amount because of their automatic price matching service. Let the buyer beware – Best Buy isn’t going to tell you that a price is discounted. You need to show it to either customer service or the representative at the register. In all the years going to Best Buy, I haven’t seen more than a couple of people attempting to price match, which is unfortunate because you are leaving hundreds of dollars on the table if you shop there regularly. Bottomline – just be sure if your retailer price matches that you take a minute to see if it is less expensive elsewhere! 3. Car insurance premiums can creep up on you. You would think with one out of every 10 commercials seemingly being an advertisement for car insurance, everyone would know by now that we should be shopping for our car insurance. Yet, for most everyone we meet the first time, car insurance is just one of those things that people pay without thinking about it. Well, we are all mandated to have car insurance, but you aren’t forced to stay with any one company! One way you could potentially save money is by shopping around and comparing rates at least once every few years. Studies suggest that less than 50% of us shop for car insurance, even though companies like Zebra report that 81% of us report a desire lower rates. Zebra is an online car insurance search engine, so you can consider it the Google of car insurance searches. Just like we compare the prices of all our online goods, we can now have a reliable way to shop car insurers easily. Zebra says that they can compare your options from 204 providers in less than 60 seconds. So, see if the Geico commercial is right. Maybe Geico is right when they say “15 minutes could save you 15 percent or more on car insurance.” Log on to find out. Note: Be sure when you are doing this that you compare the same level of benefits to your current car insurance program. Anyone can show cheaper rates by offering less coverage or amenities. Make sure it is apples to apples. You can’t just switch because car insurance is cheaper without being absolutely certain the level of your benefits match! 4. Do not fight trying to keep up with the Joneses. You have seen their new chandelier. You couldn’t help but notice the new cars in the driveway. How did they take so many vacations this year? All questions you wondered of all your friends at some point or another. Here is where it gets financially dangerous – you say to yourself, “Well…. since they just went away on a trip and bought that new car…I should be able to do the same.” No. That is not how I want you to think about spending. It’s a tough urge to fight when you see those around you celebrating with piles of new things and life experiences. We get that a psychological effect takes over. A sudden urge to own or voyage to new destinations surges into your brain whereas you had none of these thoughts before seeing someone close to you acquire the same thing. We say – fight the urge. If you want data to support how much money you should be spending or saving, check out Status Money – a site where you anonymously compare your financial situation with peers without embarrassment or fear. If you link your accounts, it plugs into their database and then you’ll be able to compare your income, debt, interest rates, credit score, spending and other items. Now you can finally see how others are really doing, while figuring out what you might be able to do financially better.